Do you want to make your wedding the talk of the town? If so, look at the wedding reception table setting ideas that we have showcased below after a great deal of research and hard work! Yes, its real hard work that you need to put in when planning for a grand and stunning wedding, and who do you think can help you in this regard? Well, its us! Weddings, we know must look grand and stunning, with every feature that must stand out. Wedding reception decor cannot be deemed complete unless wedding tables at the venue have been properly decorated. There are myriad wedding reception table setting ideas that can help you achieve stunning tables. The wedding table setting ideas showcased below are not just glamorous but are equally popular. From gorgeous glass centerpieces that you spot in many wedding table setting ideas, to floral arrangements, to using crystal ware and antique gold rimmed cutlery, there are endless possibilities for an opulent wedding table setup. Lets read further and get surprised! Crystals and wedding reception table decorations go hand in hand. Glassware made of shimmering crystals can accentuate the beauty of any wedding reception decor. Its not just your cutlery that can be made of crystals but also lamps and other centerpieces that adorn most wedding tables. We have showcased a few stunning crystal pieces below that can set the style quotient really high, like the stunning candle holder made of crystals. Low hanging crystal chandeliers too can be added as decorative pieces. The stunning wedding table setting ideas with crystals that you can look below add a distinct charm to your wedding tables. These days, there are lots of options wherein you can DIY your wedding tables and believe it when we say that DIY is the way to go this year as far as stunning weddings are concerned. 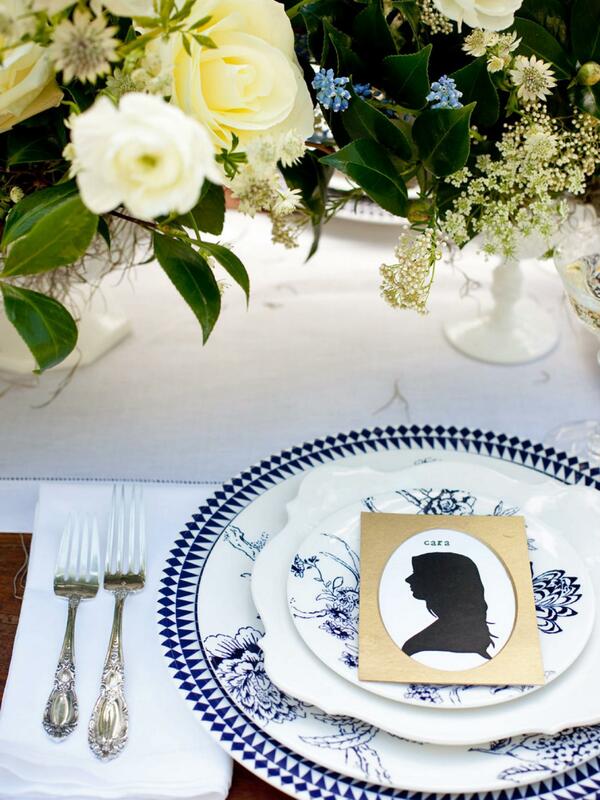 Wedding table setting ideas with DIY elements are the flavor everyone is talking about. From creating your own ‘place or table’ cards that bear the profiles of the couple who are going to wed with silhouette art, to stamping the names of guests on these cards, to adding pink prints and patterns on wedding table cloths, there are hundred different ways you can decorate the tables at the venue. You can bring in the harvest flavor by decorating the tables with burlap runners and pieces wrapped with the same rustic material. Look below at some of the DIY wedding reception table decorations that look stunning from the word go! Pink and white wedding reception decor is an all time favorite with almost everyone and there is a reason for it, the reason being the elegance that exudes out when you mix and match these two beautiful colors together to create a stunning wedding reception table setting. Pink is a shade loved by women, specially brides and hence there is no denying the fact that its one of the most adored colors around the globe when celebrating romance and events related to the heart. Pink is not the only shade to be used rather extensively in table decoration at weddings, white too is another loved color that finds its place in wedding reception table decorations. Either use pink floral arrangements as centerpieces on tables, or tie bows made of silk ribbons to create a romantic look. The pictures below showcase stunning wedding reception table setting ideas in beautiful combos of pink and white. The tables look amazingly gorgeous with pretty pink flowers arranged seductively as centerpieces as well as pink and white candles that compliment the look. Wedding reception table setting ideas involving candles and flowers is old, no doubt, but are always in great demand. Gorgeousness comes easy with a purple wedding reception decor as can be witnessed in the images below. An all time popular shade, purple has a mesmerizing effect on everyone. The color stands for mystery and royalty and can lend a very artistic look to any wedding table setup. You can use purple as the only combination on a wedding table setup or else there are options to mix it along with other cool accents like blue, green in various tones, mauve, rust, gold and yellow. A few images shown below are those of stunning looking wedding reception decor ideas that have purplish accents splashed all across in various accessories like napkins, flowers, table number cards and centerpieces. Along with purple tones in some of the wedding reception decor ideas shown below, there are hints of pink, white, green and yellow seen complimenting the purple theme. A wedding can truly stand out uniquely in a crowd of usual weddings if only you have the knack for creativity. When decorating wedding tables, try thinking a little more imaginatively than you would normally such as using mix and match of accessories that lend grandness to a wedding reception decor. 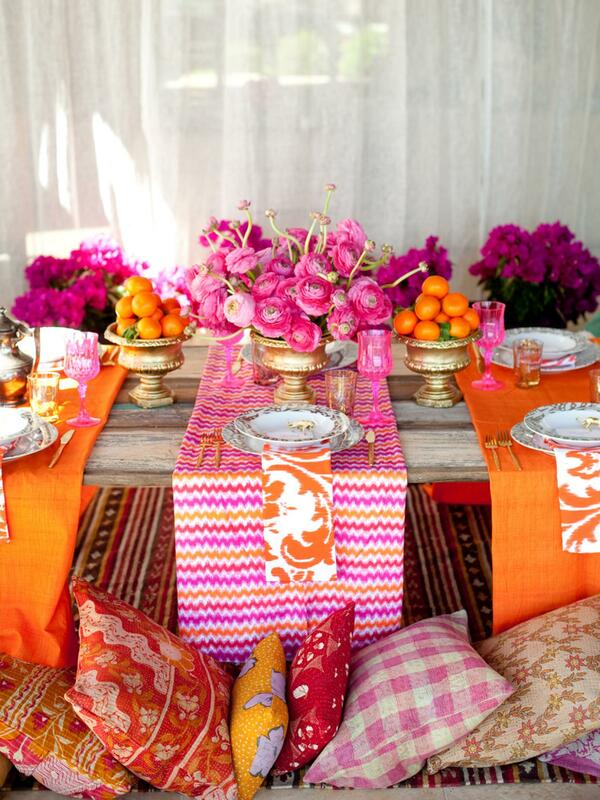 From using peach flowy draperies to cover wedding tables, installing huge glass centerpieces with elaborate bunches of flowers, to using silk tablecloths with artistic prints and patterns, to placing ‘no seating’ table cards, there are hundreds of wedding reception table setting ideas that can lend a touch of uniqueness to a wedding reception. Look below and feast your eyes on the top unique wedding reception ideas that will blow your senses! Outdoor weddings are very popular now a days and many couples are going all the way to ensure that their weddings are an event that everyone remembers for a lifetime by planning every little detail in rather unique ways that are not usually seen. Your wedding table setup doesn’t need to be boring when you have such cool and awesome wedding reception table setting ideas such as the ones we have showcased for you. Take a look at the photos below and get some ideas as to how you can bring eye catching differences to the way your wedding table looks. 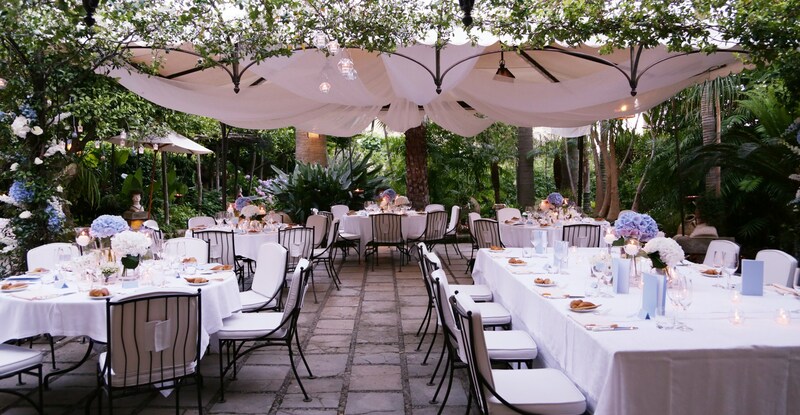 Among the listed unique wedding reception ideas for outdoor weddings shown below, there is one that is themed around the colorful season of Spring and we see lots of green elements adorning the wedding table like flowers and stems and other foliage that have been used as centerpieces to decorate the wedding table. Wedding reception decor ideas for an outdoor wedding needn’t be always themed around green, but can also involve a lot of white and other pastels like using white tablecloths, peach floral pieces and lamps as centerpieces. 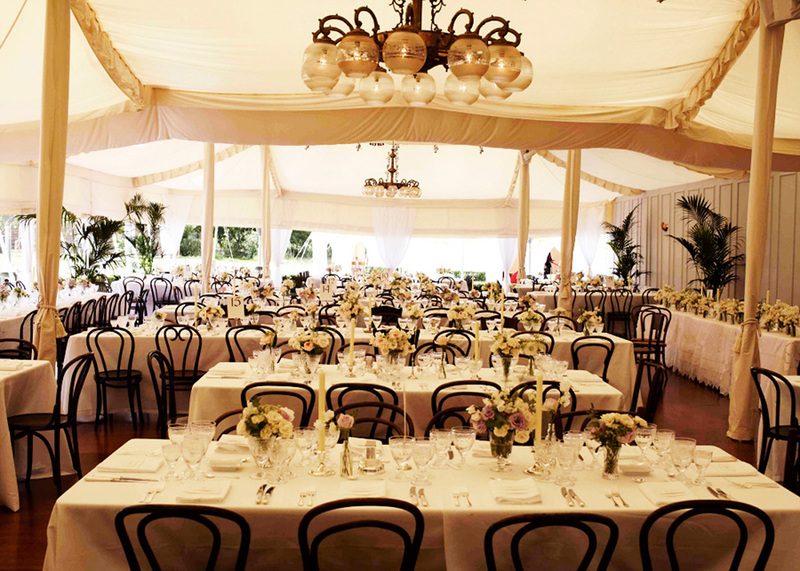 For rustic themed outdoor weddings, you can get your wedding reception decor ideas just here. Weddings are special occasions and hence must look stunning always. You must search around for a few wedding reception decor ideas that you think would suit your need and then finalize on one particular *wedding reception table setting* that you think looks just perfect for your big day. Happy reading!